Delhi, October 4, 2017: In a unique performance, Grammy award nominee, Ustad Shujaat Khan played the sitar, while a 10-year-old budding artist from the Shiv Nadar School Gurgaon, Aarav Verma, matched the artist’s tunes with the strokes of his brush on the canvas to create a masterpiece. This unique event titled “Strings Inspire Strokes” was held on October 1 at Sri Sathya Sai International Center, Lodhi Road, New Delhi. Shujaat Khan played evening ragas while keeping the tempo with Aarav’s artwork. His music complemented Aarav’s colours on the canvas. At the end of the performance, the art work made by Aarav Verma was auctioned for a noble cause. It was auctioned for Rs 55,000 and the proceeding went to Shri Ram Krishna Cancer Hospital, Deoband. Aarav, started drawing when he was three-years-old and naturally took to drawing human faces and figures when other children of his age where still busy painting flower and nature. His parents took note of his special talent very early and motivated him by providing him with different drawing materials. Aarav has not kept himself restricted to art on canvas alone, and has also experimented with sculpture. Another interesting aspect of Aarav’s artwork is that all his paintings are untitled. He does not like to concise the thoughts behind his artwork by giving them a name. 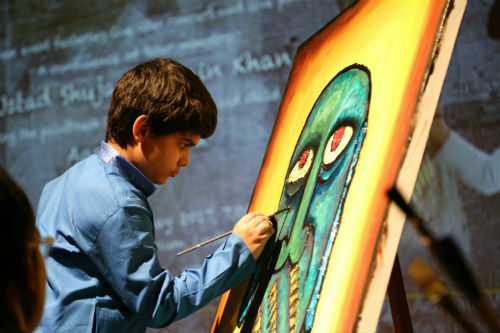 At the tender age of 10, Aarav already has 500 paintings to his credit.